A kitchen can be the most important room in the entire house. It is the one area where families tend to congregate for meals and entertaining. With kitchens becoming such a hub of activity it is more important than ever to have a fully functional and inviting space. Homeowners all across the Minneapolis and St. Paul, MN areas can benefit from working with licensed remodeling contractors from Bannochie Builders, Inc. We are a Local Minnesota Contractor and Kitchen Remodeling Experts. Bannochie Builders, Inc. is more than interior designers. We have a proven track record of transforming outdated or cramped kitchens into very functional and beautiful rooms that you are proud to call your own. Our skilled team of Kitchen Remodeling Experts may just amaze you with our ability to maximize a small space or create a large kitchen that feels intimate. As a Licensed Remodeling Contractor, Bannochie Builders, Inc. can open up a closed in St. Paul, MN kitchen for an open concept feel. We can create a gourmet style kitchen by building a room addition onto your Minneapolis, MN home. More light can be added with a new energy efficient window or a brilliant new skylight. If you spot a trend or style of kitchen in a magazine or home improvement program that you want to use as inspiration, just bring it to Bannochie Builders, Inc. We can work with your existing space to update and bring new life and style by installing new Flooring, Cabinets, Countertops, Trim, Paint, Appliances, Lighting or Backsplash. Let us build your new Dream Kitchen. 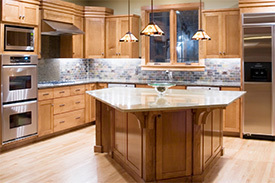 Bannochie Builders, Inc. is a Local Minnesota Contractor with 20 years of experience in creating Dream Kitchens. Our kitchen remodeling experts provide home renovation services in both the Minneapolis, MN and St. Paul, MN metro areas. See what a difference it makes to have a very functional and inviting kitchen built by highly experienced Licensed Remodeling Contractors. You will be proud to show off your beautiful new kitchen. This entry was posted	on Friday, February 6th, 2015 at 8:55 pm	and is filed under Kitchen Remodeling. You can follow any responses to this entry through the RSS 2.0 feed. You can leave a response, or trackback from your own site.